Due either to popular demand, or just the fact that I like playing with iMovie, here is the second ad for The Almost Amazing Race. This one gives away a few more details (possibly about locations) and once again stars Adrienne who is such a good sport for running everywhere I told her to on a very hot day. Registrations will be opening very soon. We’ll let you know when on this blog and if you become our fan on facebook, we’ll let you know even sooner. We can haz teh facebooks? 11.02.09 | Permalink | Comments Off on We can haz teh facebooks? 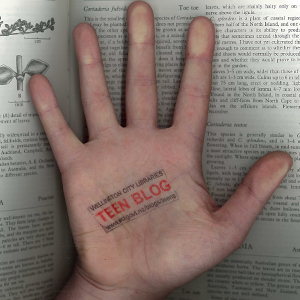 The Wellington City Library Teen Page has gone all 2.0 with its new facebook profile. You can use it to keep up to date with all our happenings – things like upcoming events, new books and CDs will be posted. Become a fan of us (we know you are already …) and receive invitations and alerts first!